Whether one is a participant, a casual spectator, a die-hard fan, or a critic, sport, in all its varieties and forms, play a significant role in the lives of most people through out the world. Sports and competitions have long been a part of human civilization and raise a wide range of important philosophical and ethical issues. 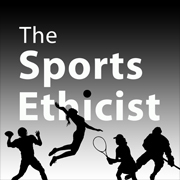 This blog will examine these issues and explore both the ethical implications of sport and the ways sport can teach us about ethics and human life. What is the ethical position re. Coaches who allow young sport participants to play (a)injured and/or in pain and/or (b) while not being aware of the risk of injury? To me this also relates to parents ignorance of the risks faced by their children particularly in elite sport. Hi John, thanks for your comment. Very interesting and important set of questions. Consequently, not easy or quick answers either! I think it’d make a good post. My brief thoughts: Sport is inherently risky, but parents and youth coaches need to be especially aware of these risks and the dangers. Additionally, giving attention to teaching and developing the right attitude and habits regarding injury and risk is important. Thanks for the reply. I agree that sport is inherently risky and injury is, almost, normal. There is the famous phrase – “if you are not nearly injured you are not training hard enough”! I guess my point is that young players, their parents and often coaches are no aware of the risk of injury. When players and coaches do become aware that does not necessarily change their behaviour – players don’t want to lose their place in the team, coaches might be short of players etc. etc .However, we seem to overplay some risks in sport – bullying of young adults by coaches – and underplay more common risks – injury. Not that I want the sort of risk aversion that stops children in primary school from running around the playground! By the way, I have done some research on risk and injury amongst girl and women footballers which involes them talking about pain and injury.